So, I did it! 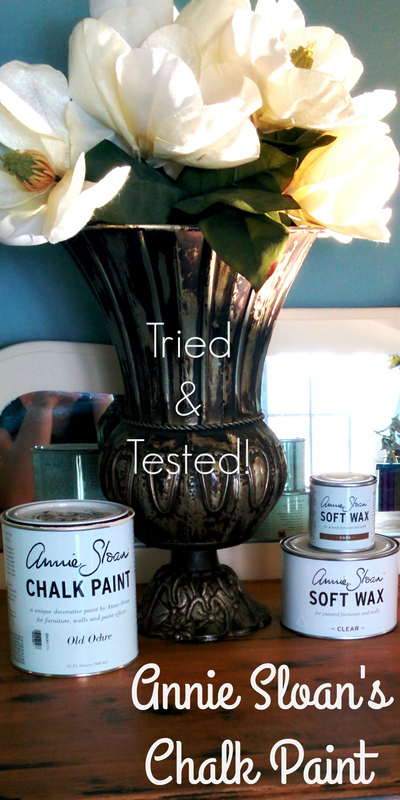 I finally broke down and bought some of Annie Sloan’s Chalk Paint… So what did I think? Would I do it again? And most importantly, would I recommend it? When it comes to crafting & DIY-ing, one of my main goals is to cut costs wherever possible, and painting furniture was definitely one of those items always up on the chopping block… Why would I buy special paint when I could just go out to my trusty garage and mix up some kind of creative concoction to get the job done? Well, chalk paint has been all of the rave lately, and I have a couple of friends who swear by it, so I finally decided to throw in the towel and try it! First of all, the color selection is amazing! They have a large variety of main colors to chose from, and then by mixing these you can easily create a whole new set of colors! It only took me two coats of paint for sufficient coverage. Yes — I said, TWO COATS! The piece that I painted was about 14 square feet, and I only used about 1.5 inches of paint out of the can! This fact significantly reduces the price-point of chalk paint. You will be able to paint A LOT of pieces from just one can! Chalk Paint can be used on a large variety of surfaces, ranging from wood and metal all of the way to plastic and fabric! Chalk paint has two different waxes to choose from to finish off your masterpiece, a clear wax or a dark wax… another super-feature of chalk paint — getting so many completely different looks out of the same can of paint! This wonderful product can also be used as an interior or exterior paint! I was able to use the dark wax instead of a stain to accentuate the grain in my unpainted wood — So easy!